Amongst most devotees of the national game, the Football Bug hits us at a young age and is from then on in a lifetime obsession. It normally germinates as a result of family or peer awareness at primary school age and then, for better or worse, remains throughout our existence. Bringing joy and pain in equal measures, football is unique in the way it grips and spellbinds its followers. Devotees to other sports and past-times may well feel just as passionate and as devoted to their interests and hobbies as we football fans do to our ‘religion’, but do they respond in quite the same way? The passion that a true football supporter feels for the game and in particular their team is, I feel, unrivalled in many other walks of life. The famous Bill Shankly quote about football being more important than life and death was born in truth and yet nonsensical at the same time. Whilst nobody would seriously argue that winning a football match or competition was on the same scale of importance as the existence of well-being of a loved one, there is very little in life to compare with the emotions garnered by the national game. I undoubtedly love my family a sight more than I do my football team and would be far more devastated should (heaven forbid) anything untoward befall them than if ‘my’ side were to suffer misfortune. However, I must confess that it is not usually my spouse or offspring that possess the ability to induce me to a nervous wreck, to have me either fist-pumping in delight or head-holding in despair. As we get older, certain things change. We (supposedly) mellow; we get wiser; we gain more experience and develop new interests; and hopefully, we become better people. Football, though, stays a constant in our lives. Living abroad as I have for practically the entire existence of the Premier League, I think it is fair to say that in many respects football and the match-going experience, in particular, is in many ways a very different beast to that when I left England’s fine shores. Since moving to warmer climates, return trips I have made to Blighty have been few and far between, but when I have been able to do so I have usually taken up the opportunity to go to as many matches, Premier League and otherwise, as my holiday time and budget allow. It is through these trips back home that I have been able to study first hand the enormous changes that have taken place during my time away. It is tempting to look back through rose-tinted spectacles and declare that everything was better back in the day, but in reality that wouldn’t really be accurate. As with most things of days gone by, certain aspects of the footballing experience were better as a child of the ‘eighties while others are undoubtedly better now. For example, while the rambling grounds of lore held a certain charm, they were largely cold, badly maintained arenas held together and marshalled on a wing and a prayer. Modern stadia and facilities are by contrast comfortable, safe, cater to families and a whole lot more pleasant to visit. Also, recent abhorrent events notwithstanding, overt racism in British football stadiums is now very much a thing of the past. The truly shameful days of mass ape-like grunting at black players, for instance, are thankfully long gone, hopefully never to return. Similarly, hooliganism while not totally eradicated, exists on a much smaller scale than previously. In the main, supporters are free to go to matches showing their colours without fear of getting a clout from some neanderthal taking exception to the fact that others support a team different to theirs. There are other aspects, though, that have sadly gone forever and are missed by many. The lack of terraces at most football league grounds is perhaps one of the biggest causes of regret amongst the football-watching fraternity. Perceived to be the cause of a supposed lack of atmosphere within many grounds, all-seater stadiums have come in for a considerable degree of criticism. Although stadiums are undoubtedly safer and more comfortable, even now two decades or more since the terraces were done away with, their passing is still mourned by some. The better facilities have been partly responsible for the sharp increase in ticket prices over the Premier League era, and invariably the demographics of the ‘traditional’ match-going football fan has changed. Whereas three decades ago a teenager could perhaps do a paper round or a couple of evenings shelf-stacking at Tesco in order to fund his or her football going experiences, nowadays parental patronage is usually the only option available. This has resulted in the average age of spectators rising markedly in the past twenty years or so. There have been many other changes over the years, of course, with some being seemingly more insignificant than others. One example I noticed upon my return to the UK was the size of programmes. Whereas football programmes at one point tended to be fold-away in size and consisted of perhaps 24 or 36 pages of varying quality and interest, nowadays at Premier League level they are often twice the size. Produced more as glossy magazines or brochures even, they weigh in at more than the price of a good seat in the main stand back in the day. Ironically, the very fact that they are so over the top production-wise and hence so expensive, has led to a decrease in sales. This, in turn, has led to a number of clubs looking at the possibility of ceasing selling them altogether. That stadiums are now all-seater means getting in and to ‘your spec’ in the ground has also changed considerably. Once the challenge of actually being able to procure a ticket has been overcome, a fan knows he or she can turn up at the ground thirty minutes before the game and leisurely stroll to their seat a couple of minutes before kick-off should they so wish. Contrast this with days gone by when in order to get a decent spot on the terraces for a big game, one would invariably have to arrive at the ground a minimum of two hours prior to kick-off. A lengthy, sweaty, and often unsafe queue would then ensue before gaining entry onto dirty, crowded terraces and a further hour-plus wait for the teams to emerge. The treatment of supporters inside the ground has changed somewhat in the current era, and not just in terms of facilities. Of course, there are no perimeter fences anymore, and stewarding seems a little more patron-friendly than the heavy-handedness of the police in days gone by. This contributes to the more pleasant ambience that permeates in many stadia now, and that surely cannot be a bad thing. The herding of away supporters after the match is something that continues to this day, however, but to be fair to the authorities it is hard to think of a really viable alternative. Unfortunately, there is still a minority who, if given the opportunity, would take great delight in beating seven bells out of each other and so things are unlikely to change much in this area. For all of these changes, some welcome and some not so much, there are other aspects of the match going experience that have remained comfortably and reassuringly stable over the years. That the basic sensory components of a football ground and its surrounding areas remain constant throughout the shifts of time is somewhat comforting in an ever-changing world. The smells and noises of a big game, although slightly sanitized these days, still have a familiar ring to them. 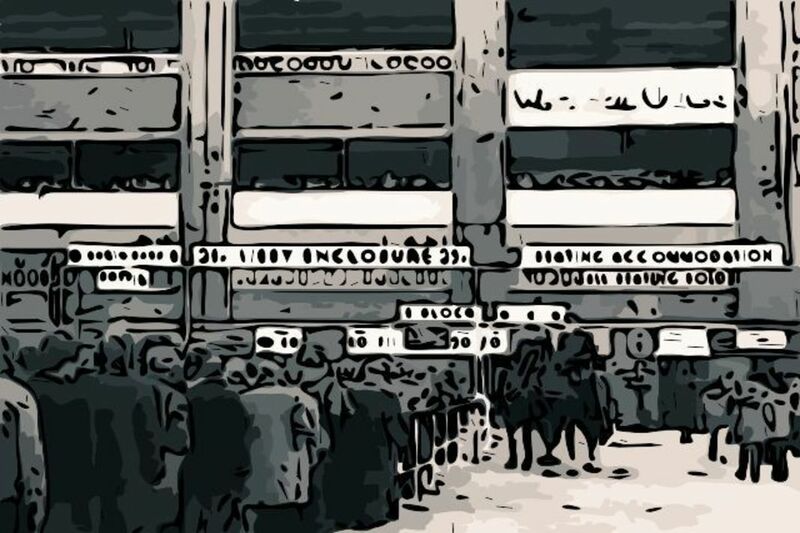 Approach the stadium and it is likely you will be assailed by the dual aroma of burgers and horse manure. This tag-team assault on the football-going public’s collective nostrils is a facet that shows no sign of dying out anytime soon. Noise levels within grounds these days tend to vary. The fact that crowds are no longer the singing swaying masses of before has diluted the atmosphere to a degree. However, average attendances are considerably higher than three decades ago, and the sheer volume of people within an enclosed space can sometimes lead to higher decibel levels and an exciting atmosphere, even if it seems slightly manufactured at times. The one aspect of football that never changes, though, is the feeling of belonging. The sense of excitement, nervousness, dread, fear, and downright enjoyment – not only for those lucky enough to be able to attend regularly but for all of us in the football-loving brood. The hoping, dreaming, worrying, celebrating of victories and mourning of defeats is something that, thankfully, will never dilute with age or circumstance. Living here in Indonesia, live football is aplenty via satellite and subscription television, but due to time differences and life obligations, it is not always possible to follow matches as they happen. This means catching up with results the next day is sometimes necessary and even now as I tick the big ‘five-oh’ off the calendar of life, whenever I reach for the mobile to check the scores at 5am in the morning, I do so with a thumping heart and sweaty palms. Quite why football should have this effect on me on me and my like-minded brethren is perhaps a moot point. It can be said to be both a blessing and a curse in as much as while football undoubtedly adds colour and excitement to life, it also drains emotionally and leads to claims of us living our lives vicariously. We wouldn’t have it any other way. Would we?